There are three avoidable surprises that derail even the most cautious pavement management plan. For every pavement management plan that works, there are many more that flop. Depending on your budget and the spectrum of pavement assets you ownership of, your approach will change. They look at the money they spend "keeping good roads good" as a luxury. And that’s a mistake because when you ignore the long term lifecycle of pavement… you risk leaving millions on the table. (Quite literally! Whenever possible, focus on the long term consequences of ignoring your good roads. Turning roads black does not mean you are extending the life of your pavement. Agencies install a treatment to the surface that turns the roadways black, but does not affect the texture of the road surface. Result: Little or no extension is actually done to the life of the pavement. A great side benefit is that the pavement retains a deep black color that contributes to higher property values and overall aesthetic appeal. The third common mistake here is to assume that it is best to wait several years before applying preservation treatments to new asphalt. 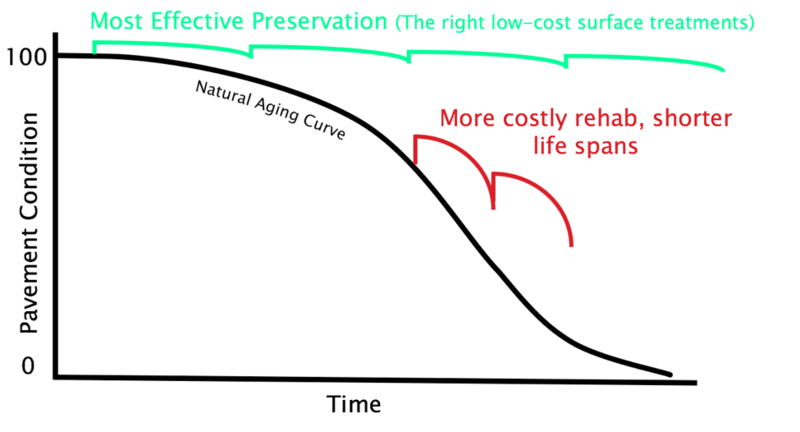 Here is a little secret the industry has stumbled upon only relatively recently: the highest period of oxidative aging occurs early in the pavement lifecycle. If you wait until you have complaints from residents, then you have waited too long. Being proactive and using the latest engineering advancements in preservation such as High Density Mineral Bond (HA5) can be especially advantageous for lowering the costs of pavement ownership. If you look at a traditional curve over time showing deterioration of pavement condition, it is a smooth slope over time. However, we now know that isn't telling the full story. A dollar spent now on effective pavement treatment can easily save you $6 or more later (American Association of State Highway and Transportation Officials). Once you allow your pavement to manifest distresses, those are now permanent problems that you will need to continually address. And there you have it. The three most common pavement management mistakes and ways to fix them. There’s literally nothing stopping you now from making it work for you too!